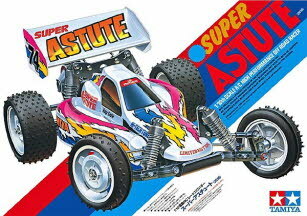 Tamiya is delighted to announce the updated re-issue of another classic: the Super Astute (originally released as Item 58097 back in 1991). The basic construction and design of the model remains true to the original, with various minor upgrades. Super fun off-road driving awaits with this high-performance 2WD buggy’s rugged chassis, durable suspension and TTC (Tamiya Traction Control system). This is a 1/10 scale 2WD R/C model assembly kit. 2.5mm thickness FRP chassis gives a low centre of gravity for excellent balance. is not compatible with square-shaped battery packs. gears from impacts and gives stable drive by limiting wheel spin. simply by removing the gearbox cover and turning the lock nut. 2-channel radio, steering servo, electronic speed controller (ESC), motor, 7.2-volt battery pack & charger, and Tamiya PS/TS paint, tools for assembly.